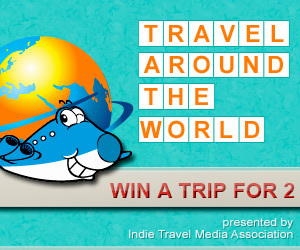 Win a Trip Around the World for Two! Two runners up will win more great prizes! Wanderlust and Lipstick has joined 9 other top independent travel sites to give away the ultimate traveler’s dream – an around the world trip for 2 that includes a whole plane full of prizes! Yup, you’re going to have the opportunity to take that sabbatical, take a year off from school, or put your unemployment situation to good use. We’re giving you the chance to take off for a year and all you have to do is put a little bit of your travel knowledge to the test. The challenge? Guess the route of where the Round the World journey will take you. Each week, participants guess the destination from the provided clues and then enter online. One winner will be randomly chosen from the correct answers each week and awarded a weekly prize. After 8 weeks–with 8 chances to win–everyone will know the route and there will be 8 finalists. One of those 8 finalists will win the Grand Prize package for 2 while 2 more winners will receive the First and Second Prize awards! Here’s where to find the Around the World Contest. BootsnAll Travel Network – The traveler’s one-stop indie travel guide, which began publishing travel on the web in 1998. ConsumerTraveler.com – The web home of the Consumer Travel Alliance, which fights in Washington for reform of air travel, rollback of fees and for airline passenger’s rights. GoNOMAD.com – Provides travelers with inspiration and links to plan their trips. JohnnyJet.com – Home of intrepid traveler John DiScala, who flies more than 150,000 miles a year and provides comprehensive articles about everywhere he goes. Perceptive Travel – Includes the best stories from authors on the move. Practical Travel Gear – The top blog for daily reviews of travel gear and travel clothing. TransitionsAbroad.com (founded in 1977 as the print magazine) – Provides articles, resources, and program listings for long-term travelers seeking to work, live, volunteer, or study abroad. Travelfish.org – The go-to guide for Southeast Asia, with daily articles and iPhone apps you can download to give you details about any country in their region. I have never win to any contest..so far !!!! Can pple from other continents win this??? Sandy – this contest concluded earlier this year. SORRY!